More great Pictures Bob G! Seems like you've moved the history of flying at Mossy Bank Park back from 1980 to 1977! That takes original Mossy Bank Park hang gliding flight activities back 38 years! Oddly now, after all that time the Village (or some committee?) wants to end hang gliding flight activities . . . for what reasons? Because farming up to the base of the bald eagle's nesting tree and explosive gun shots during Mossy Bank Park's own allowed hunting season (on their property, the boundary of which closely abuts the area including the nesting tree) are NOT disturbing the the local bald eagles? 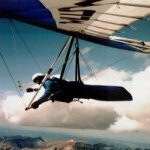 In fact, silent hang gliding flight is the least "disturbing" activity when placed in a realistic and rational perspective. skydogsports.com has a great history of photos archived from all over the country!!! Thanks for sharing them with us Bob! !